The catalogue is published in conjunction with Kateřina Šedá’s UNES-CO project, which is representing the Czech Republic at the 16th International Architecture Exhibition in Venice. The depopulation of historic city centers and the local residents’ relocation to the outskirts is one negative effect of increasing tourism, and Český Krumlov and Venice have not remained untouched by it. 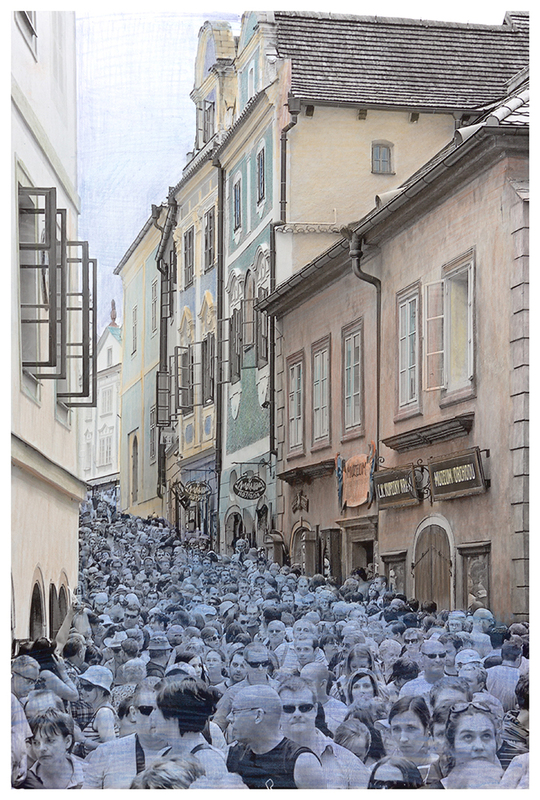 Artist Kateřina Šedá’s fictitious UNES-CO company tries to reverse this trend by gradually “warming up” city centers with human life. In Český Krumlov, “normal” residents will return to the historic city center, where they will live in several houses and apartments for a period of three months (1 June – 31 August), performing activities that are commonplace elsewhere. To this end, the UNES-CO company will not only offer them accommodations, but most importantly will also pay them a wage for carrying out NORMAL LIFE in the city center. The seat of the UNES-CO company will be in the Czech and Slovak Pavilion in Venice. At the company’s reception desk, visitors will be able to leaf through catalogues offering normal activities and watch a broadcast from Český Krumlov, where a test-run of this “warming-up” of the streets will take place. The aim of the project is not only to draw attention to this phenomenon, but above all to produce specific solutions for such affected areas. The UNES-CO project’s catalogue has been conceived as a presentation of this new company and as an interim report on its activities. In the introductory chapters, Šedá makes a clear reference to the cultural heritage of UNESCO through the use of visually similar materials and logos in order to emphasize the direct relationship between the two organizations. The “list of endangered activities in the centers of UNESCO cities” offers an overview of activities that are slowly disappearing from historic city centers. The catalogue’s other chapters explore the subject of tourism in general through newspaper articles and interviews with people in Český Krumlov. Local residents’ viewpoints and interviews with selected local personalities show that normal life has been slowly disappearing from the center of this tourist destination and that none of the locals have an effective approach to curing the city’s ills. In the rest of the publication, UNES-CO presents its unusual employment opportunity for locals – and also for families, couples, and individuals from other towns. The catalogue includes letters of motivation from applicants for these job openings, plus media reports and the public response to the project – both on social networks and among locals. Another section of the catalogue features texts by invited experts such as the director of Finland’s IHME festival Paula Toppila, Czech curator Pavlína Morganová, and Vilém Švec of the National Heritage Institute.